The concept for our Global Scholars Program was inspired by Fairleigh Dickinson University's founding mission as an institution that is "of and for the world." As a Global Scholar, you will be part of a distinctive community of learners who are committed to world citizenship and to developing a global perspective as tomorrow's leaders. A Global Scholars Seminar in the fall term of years one, two, and three of your program. Regular discussion meetings with other Global Scholars in the fall and spring terms of the first three years. Regular participation in and/or organization of various local and/or international volunteer projects. Organization and hosting of two special speaker series at the Vancouver Campus (mostly in the fall and spring terms): the 'Diplomatic Circle Series' -- with talks by consuls from various parts of the world -- and the 'Distinguished Visitors Series' -- with renowned speakers from various disciplines. Opportunity to participate in other local talks, conferences, and events concerning global issues. Organization of and/or participation in a variety of (multi-) cultural events on and/or off campus. Participation in local field trips. Opportunity to participate in international conferences and/or other events about global topics -- including the Model United Nations. Opportunity to study a semester abroad. Opportunity to participate in co-curricular field experiences at FDU campuses in New Jersey and elsewhere. 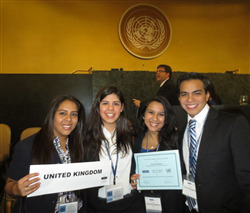 Opportunity to visit the UN Headquarters in New York if you spend a semester at FDU New Jersey. There is no additional tuition for special credit-bearing courses, co-curricular experiences or the semester abroad. However, costs related to travel and living expenses while traveling and/or studying abroad are the responsibility of the Global Scholar. High school graduation with an 80% average or higher in final grade 12 courses. Students with an average of 76% or higher may be considered if evidence of school and/or community involvement (with a global emphasis) has been demonstrated. Interest in participating in school and/or community volunteer activities that help create a better future. Demonstrated leadership skills and willingness to use these skills in organizing projects and events. Desire to take responsibility for creating a sustainable, peaceful, happy, and healthy world for all. Each year, approximately 12-15 students are selected to participate in the Global Scholars Program in Vancouver. Apply online for the Vancouver Campus undergraduate program. Include Global Scholars Questionnaire. Questionnaire can be submitted when filling in the online undergraduate application. Attach resume or list of achievements, including community involvement and volunteer experiences, with your online application package.